We’re still looking for our four-leaf clover and a pot of gold, but we found plenty of race results on this Saint Patrick’s Day weekend. 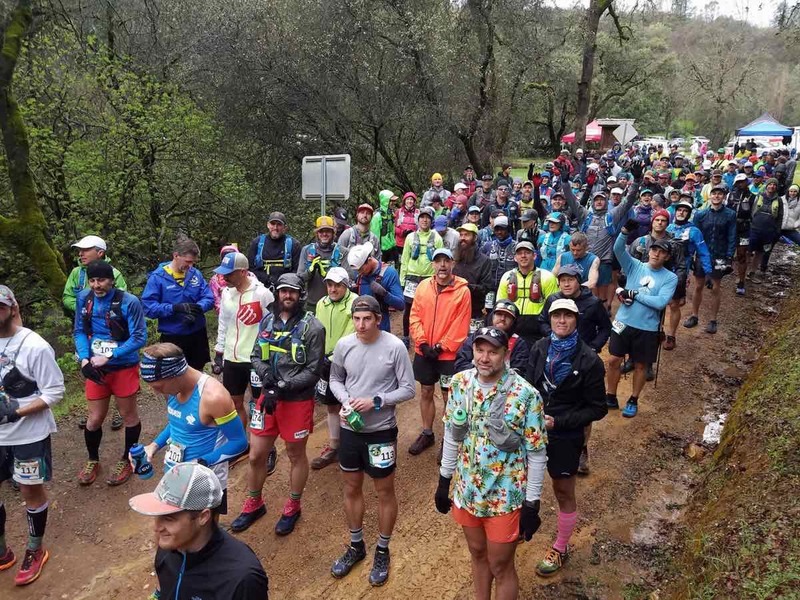 Check out our recaps of the Chuckanut 50k here in the U.S., and highlights from a couple of ski-mountaineering races in Europe, and trail events in France and Spain. Smooth running at the start and finish with spikes totaling 5,000 feet of climb in the middle, that’s the famous Chuckanut 50k course. Runners have been challenging themselves on this Pacific Northwest classic for 26 years now. The women’s race was full of well-known names, and so Keely Henninger‘s win was a stout one. Just 25 years old, upstart Henninger improved on her 2016 finish time by 19 minutes. Not only that, but her victorious 4:07 run ranks second all time on the race’s historical charts, trailing only a 4:01 sprint by Jodee Adams-Moore in 2013. Look for Henninger to keep that upward trajectory going next at April’s Lake Sonoma 50 Mile. Left in her wake was a string of would-be challengers, but none of them close when it was all over. Anne-Marie Madden was second in 4:15, and Gina Slaby was third in 4:28. Like Henninger, Slaby is next racing Lake Sonoma too. Ellie Greenwood was fourth, like Slaby also in 4:28, though officially another 12 seconds back. It was Greenwood’s seventh Chuckanut, but her first ultra in two years. Though limited to the 50k distance, early returns are high on Cole Watson. Barely two years into his ultra career, the Ashland, Oregon standout won here in 3:36. It was the fourth-fastest finish in race history, following 2017 runs by Max King and Hayden Hawks, and King’s 2014 run, too. Patrick Smyth chased to a second-place finish in 3:40, and after that, things got tight. Finishers three through seven were separated by less than four minutes, and each of the top-10 men ran inside four hours. Pierra Menta is one of Europe’s biggest ski-mountaineering competitions, in part thanks to a history that dates to 1986. The race took place in four separate stages, over four-straight days. 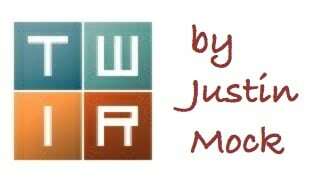 We cover it here as lots of European trail runners crossed over to race this weekend. The women’s race was close! Axelle Mollaret (France) and Katia Tomatis (Italy) won the first three stages, and then defending champs Emelie Forsberg (Sweden) and Laetitia Roux (France) came back to win the fourth. 11 minutes separated the two teams at the end with Mollaret and Tomatis totaling 12:11 to Forsberg and Roux’s 12:22. Spanish pair Mireia Miro and Marta Garcia were third in 13:21. Ida Nilsson (Sweden) was part of the fourth-place team with Fanny Borgström (Sweden). The men’s race had some drama, too. 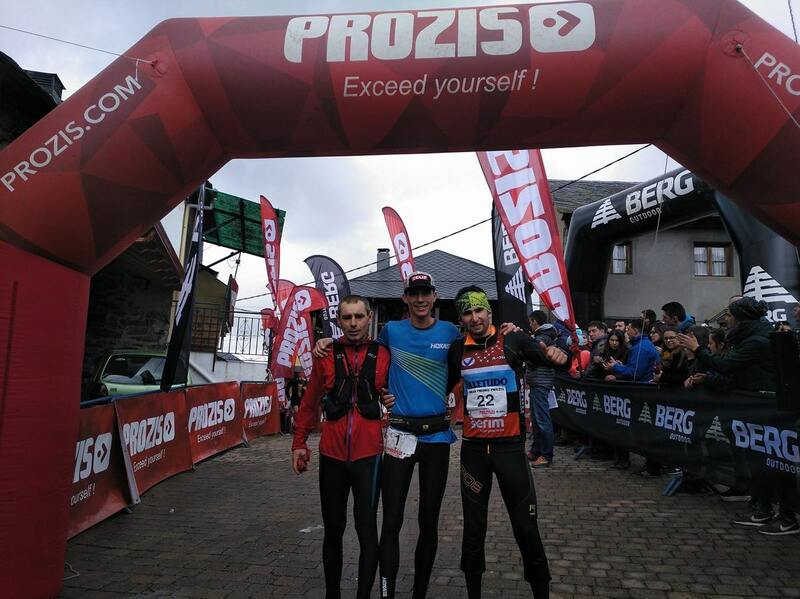 After finishing third on day one, Kilian Jornet (Spain) and Jakob Herrmann (Austria) won on days two and three. Then, late on the fourth stage and with the overall win in sight, Jornet fell and suffered a broken fibula. The two did not finish. Though no one wants to win in that way, Italian pair Michele Boscacci and Robert Antonioli became the overall winners then in 9:57. They were most closely followed by two French teams. Xavier Gachet and William Bon Mardion were second in 10:05, and Valentin Favre and Didier Blanc were third in 10:28. Deeper results include American skiers John Gaston and Tom Goth in 10th. François D’haene (France) teamed with Alexis Traub (France) to finish 12th, and Ludovic Pommeret (France) and Florent Besses (France) were 18th. 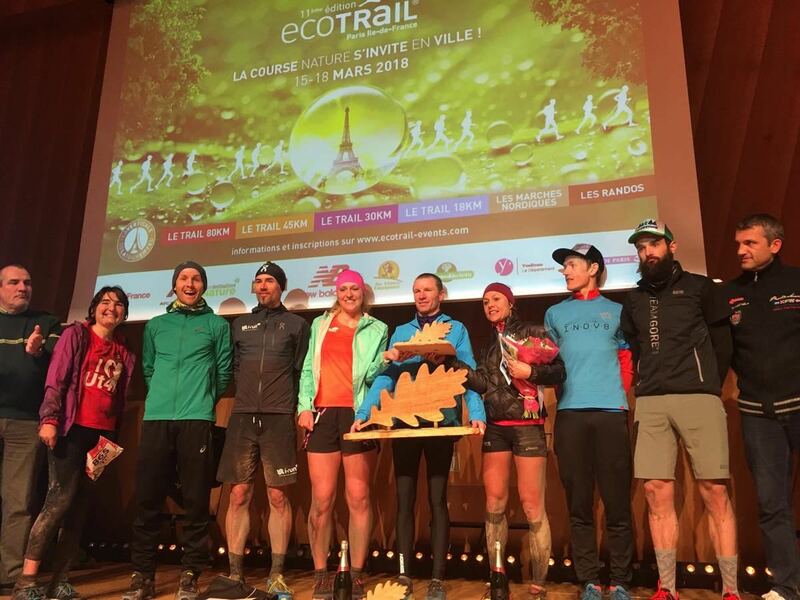 After chasing nature around the City of Lights, in snow, the 80k EcoTrail Paris finished with a trip up to the first floor of the Eiffel Tower. French runners swept the podium and Sylvaine Cussot and Gaelle Decorse finished in a first-place tie at 7:34. Clair Bannwarth was a close third in 7:36. Other top runners in the race included fourth-place Francesca Canepa (Italy) and sixth-place Juliette Blanchet (France). T’was to be a race of Emmanuels for the men. Emmanuel Meyssat beat out French countryman Emmanuel Gault to win with the pair running 6:00 and 6:05, respectively. Third-place Didrik Hermansen (Norway) clocked 6:14. Andris Ronimoiss (Latvia) was another notable entrant, finishing fourth in 6:16. The 46k Trail du Ventoux is big in southern France. This year’s race had nearly 900 finishers, and like many other races in Europe this weekend, had some sections of snow. Second a year ago, Lucie Jamsin (France) won this year in 4:59. Claire Mougel (France) and Maryline Nakache (France) were second and third in 5:11 and 5:17. The men’s race ran as a case of deja vu. Marc Lauenstein (Switzerland) was again first, and Ludovic Pommeret (France) was again second, just like in 2017. The two finished in 4:00 and 4:00, exactly 30 seconds apart. Yeah, if you just did a double take, good eye. Indeed, Pommeret’s race must have made for a quick double, or rather quintuple, with the four-day Pierra Menta ski-mountaineering race on Wednesday through Saturday and the Trail du Ventoux on Sunday. Romain Maillard (France) was third in 4:01, or just 13 seconds back of Pommeret. A year ago, Spain’s Carrera Alto Sil 42k happened in exceptionally dry conditions. This year’s 10th anniversary run was the complete opposite with sections of deep snow, certainly a challenge on a course that already includes 9,000 feet of climbing. Denisa Dragomir won for the ladies in 5:14 in an all-Spanish podium, while Aora Sio was second in 5:35 and Estelita Santin was third in 6:12. Men’s winner Jim Walmsley (USA) was a repeat champ, finishing in 4:37. Spanish runners Francisco Gonzalez and Fabio Bazzana were second and third in 4:41 and 4:43. Full results (when available). Mike Foote spent 24 hours skiing uphill (and then downhill again) this weekend to set a new world record for the most vertical feet gained in 24 hours at 61,200 vertical feet. He did it at Whitefish Mountain Resort in Montana, by repeating the same 1,020-foot ski run 60 times. The previous record of 60,350 feet was set in 2009 by Austrian Ekkehard Dörschlag. The second-annual Lhotse 24-Hour Endurance Challenge happened on a track in Oklahoma. Race winners were Jacklyn Long and Wyatt Hockmeyer with 77 and 88 miles, respectively. Early on, the story was Camille Herron, making another world-record attempt. However, she succumbed to kidney problems after some 11 hours and 75 miles run, and then spent the night in the hospital. Herron is expected to make a full recovery. Full results. Having missed the recent Way Too Cool 50k with illness, Cat Bradley made good with a 4:47 win at southern California’s Montana de Oro 50k. Men’s winner Chris Baird finished in 3:50. Both look to have reset the record books with a new course best. Full results. The Ruck a Chuck 50k is held entirely on the Western States Trail in northern California. Race winners Amy Phillips and Kris Brown both set new course records in the race’s third running. The pair ran 5:02 and 3:45. Look for Brown back here in April for the Canyons 100k and then again in June for the Western States 100. Full results. In Hinkley, Ohio, since 1957, they’ve celebrated the March return of buzzards. Of course! And for the last five years, they’ve further celebrated it with a trail race. Beth Gilday and Jeffrey Adams won the 100k race in 15:53 and 10:21. Barb Mackey and Travis Zipfel won the 50k race in 6:24 and 4:01, and in the 25k, Pam McGowan and Speedo-wearing Coree Woltering won in 2:40 and 1:55, respectively. Buzzards and a Speedo, yep. Full results. Aravaipa Running’s Mesquite Canyon event had both 50-mile and 50k race distances at the White Tank Mountain Regional Park outside of Phoenix, Arizona. Fifty-mile winners Lisa Moore and Michael Traub fought to 10:43 and 9:33 winning times, and 50k winners and recently engaged couple Nicole Kalogeropoulos and Zach Bitter went for 5:07 and 4:19 runs. Full results. The Lyndon B. Johnson National Grasslands stretch for some 20,000 acres in big Texas, and the 20th annual Grasslands Trail Run covers some portion of that expanse. Shandra Moore and John Finn won the 50-mile race in 8:01 and 6:23, and in the accompanying marathon, Melanie Rabb and Kalib Wilkinson were victorious in 3:48 and 3:16. Of note, Finn also broke his own course record. Full results. Sage Canaday won his weight in beer at the Shamrock Run 15k in Portland, Oregon. He ran a hilly 47:23 as part of his prep for April’s Boston Marathon. Full results. At the LA Marathon, Ian Sharman progressed his build toward the Western States 100 with a negative split 2:40. Full results. St. Patrick’s Day weekend proved deserving of a big column. Help us fill in any gaps below! John Kelly set the new unsupported FKT for SCAR (Smokies Challenge Adventure Run). The route, 72ish miles with around 18,000 feet of climbing, follows the Appalachian Trail through Great Smoky Mountains National Park. His time was 15:31:37. Will Harlan held the previous unsupported record at 15:45:07. John was going for the David Worth’s supported FKT of 14:50:22. Brand new race here in Memphis – the Big Buffalo 50 – held three races this past Saturday. Jessica Hardy and Kyle Grady won the 50 mile races, while Dana Horgen and Jeffrey Baskin won the 50k options. Podium results, including those for the 50k relay can be found at https://bigbuffalo50.racesonline.com/results. 1. My weight in beer is 19 gallons. 2. Those Lhotse 24-hour results look like 12-hour results to me. Unfortunate fall for Kilian. Sad that he will be missing some races… not sure if he was planning on Hardrock again, but I guess he’s out now. Will he be on time for UTMB? Great day in AZ, Noah did an incredible job with Mesquite — a challenging course, great views, lots of open single-track, good aid (those folks from Surprise outdo themselves every time! 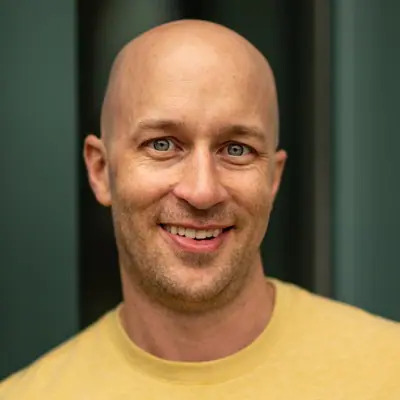 ), fair cuts, the DJ takes requests, and there’s pizza and beer waiting for you at the finish no matter how far back you come in…even a Tim Olson sighting! What more you want from a Saturday? Also a little TNFECS race in Peru. BRUTAL! Well done for the record!! !